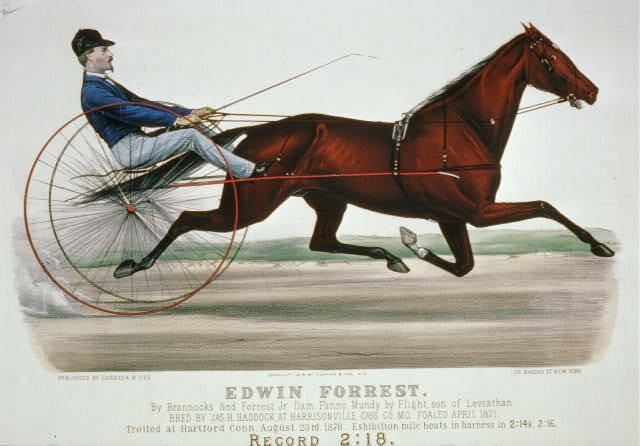 Currier & Ives print of racehorse named after Edwin Forrest. Courtesy of the Library of Congress. We all love our celebrities. But would you name your car after one? Your boat? A fire engine? In nineteenth-century America, theatre fans did this all the time. You can see one example in the picture above, which is named after Edwin Forrest, who’s been called “the first star of the American stage” by biographer Richard Moody. 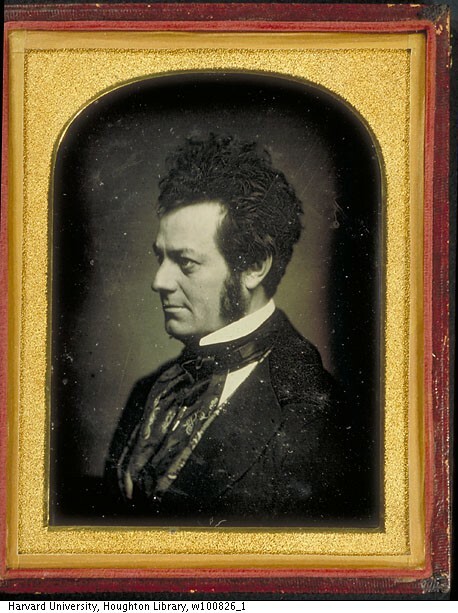 Mid-19th-century portrait of Edwin Forrest. Courtesy of the Harvard Theatre Collection, Houghton Library, Harvard University. Caricature of Edwin Forrest in the role of Spartacus. 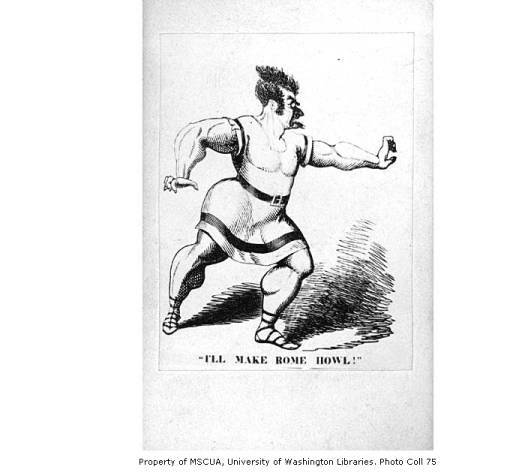 Courtesy of the University of Washington Libraries. Forrest was used to having people name things after him. Historian Bruce McConachie notes that the actor found his name attached to “steamboats, racehorses, fire engines, and locomotives,” amongst other such “objects of power and danger.” (Melodramatic Formations, p. 70-1) You can get a sense of why this was so when you look at the above caricature of Forrest as Spartacus. To put it in technical scholarly terms, dude was jacked. In fact, many people made fun of Forrest because it sometimes seemed that his muscles were pretty much all he had going for him in terms of theatrical ability. He didn’t make much of a hit when he crossed the pond to England, and the resulting hurt feelings eventually contributed to one hell of a disaster back in New York (I’ll be writing a post about that incident in May, closer to the anniversary of said disaster). Forrest had a bunch of Shakespearean roles in his repertoire, but the roles in which he really seemed to excel were melodramatic ones, like Spartacus (no, not this Spartacus) and especially Metamora, a doomed but heroic Native American chief. 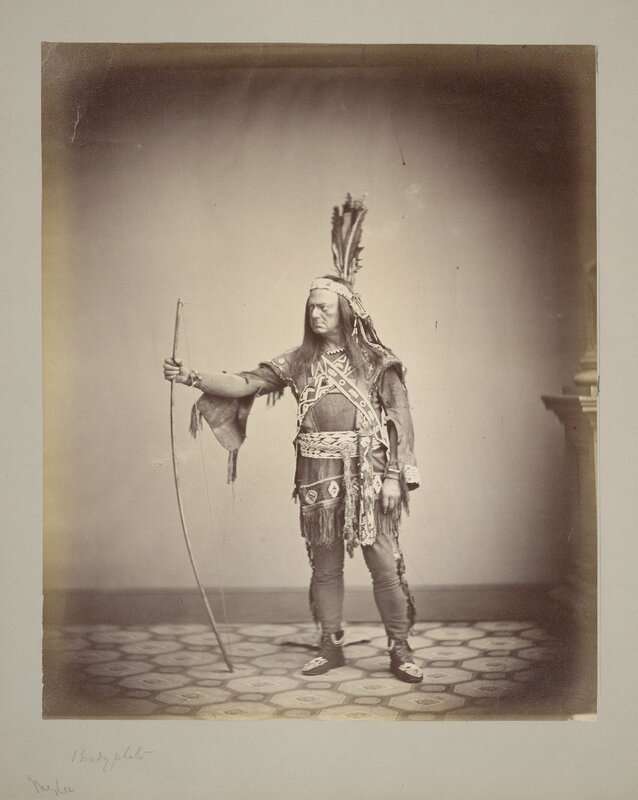 An older Forrest as Metamora, c. 1861. When he was younger (the 1820s and 30s), the role brought him fame and fortune, but as this pic shows, man can time be *rough* on an aging actor. Courtesy of the Folger Shakespeare Library. At any rate, it was these roles in melodrama, which mostly emphasized displays of Forrest’s rugged physicality rather than his acting ability, that were his bread and butter. Not everyone liked him, but those who did tended to identify with his brand of strong masculinity (to get a good sense of what it was like to see Forrest in his prime, and on home turf, read this reminiscence by Walt Whitman). Fire companies, in particular, tended to support Forrest. These were rough-and-tumble guys, whose methods could be more than a little shady (don’t believe me? take a look here), but they embraced the man who played Metamora as one of their own. Forrest wasn’t by any means alone in having things named after him – the English expatriate actress Fanny Kemble, who was about as far away from Forrest as one could get in terms of refinement and femininity, had at least a few racehorses here and there named after her. The wider phenomenon, though, is something that hasn’t really survived into our present day. Sure, if you’re ever able to afford a private yacht, you may fantasize about naming it the “Chris Hemsworth” (“BECAUSE HE’S A DREAMBOAT!” you say), but for legal and other reasons (I mean, it’s a little stalker-y, right? ), that’s not something people do nowadays. Perhaps this is the case because celebrity culture pervades our lives so thoroughly these days that we don’t need these points of contact to make us feel that sense of closeness to our favorite actors, singers, or other notables. It also reflects other changes in our society: those fire companies, for instance, were private, volunteer organizations, and they could collectively name their engine whatever they wanted.